Add a modern look to any bathroom with this piece from Kingston Brass. This classic dual-control faucet is easy to match a lot of bathroom looks. Add more beauty to your bathroom with this item's easy-to-install, deck mounted design. This faucet is WaterSense certified for less water use to give you the same clean. 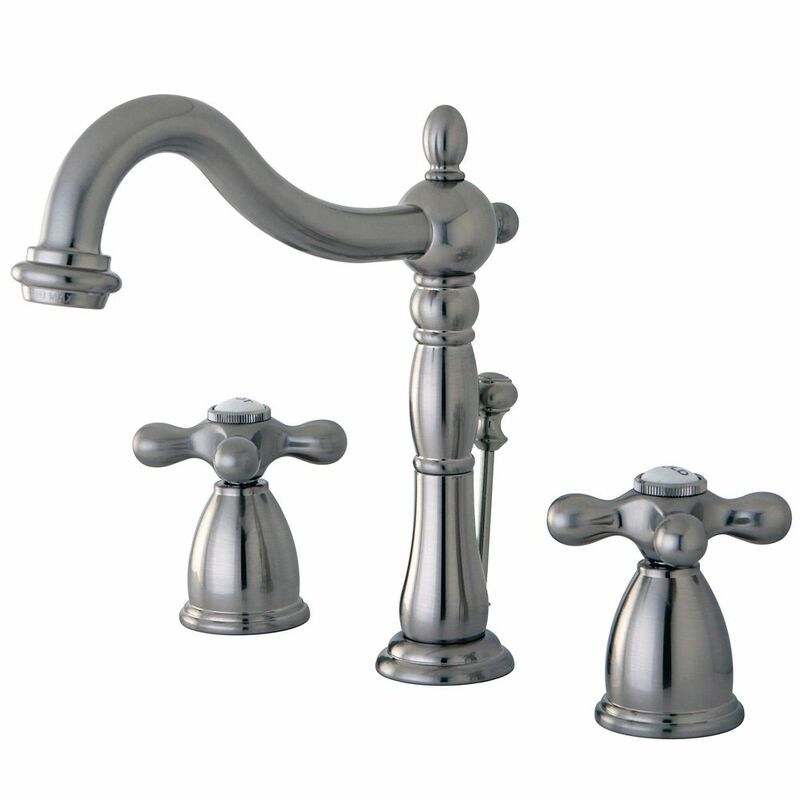 American Standard faucets are engineered to look beautiful and function flawlessly. Our exquisite designs offer innovative conveniences like pull-out spouts for the bath, easy-to-upgrade shower styles, peace-of-mind safety features, and simpler-than-ever installation and cleaning. Worry-free, drip-free and built to last, all our faucets are covered by our Limited Lifetime Warranty. Also available in store by special order only see store for details. American Standard - Style That Works Better. Add an elegant look to the bathroom with a collection that fits any style. The Princeton Collection has matching styled pieces for the bath, shower, tub, toilet and bidet to give your bathroom a coordinated look. Also available in store by special order only see store for details. The Fontaine collection by Avanity delivers glamour and style to your bath. The sophisticated curves and refined details echo Art Deco, making this a fashionable choice comfortable in multiple design settings. This 8 in. widespread 2-handle bath faucet features a classic Oil Rubbed Bronze finish. Victorian Widespread (8-inch) 2-Handle High Arc Bathroom Faucet in Satin Nickel with Cross Handles Add a modern look to any bathroom with this piece from Kingston Brass. This classic dual-control faucet is easy to match a lot of bathroom looks. Add more beauty to your bathroom with this item's easy-to-install, deck mounted design. This faucet is WaterSense certified for less water use to give you the same clean. Victorian Widespread (8-inch) 2-Handle High Arc Bathroom Faucet in Satin Nickel with Cross Handles is rated 4.3 out of 5 by 13. Rated 5 out of 5 by Chris from Beautiful faucet with a quality feel.... Beautiful faucet with a quality feel. Rated 4 out of 5 by Robert from Had some above normal water noises. ... Had some above normal water noises. Rated 1 out of 5 by Garrett from 5 for beauty and installation, 1 for functionality. The faucet... 5 for beauty and installation, 1 for functionality. The faucet turns 360 degrees and there is no way to lock it. Since there was no way to lock the faucet to just go over the sink I had to return it. Why would anyone ever need a faucet that could be moved 360 degrees?! What a mess it would make. Rated 5 out of 5 by Kim from This was a unique faucet to assemble only because each... This was a unique faucet to assemble only because each piece is individual and I had not done that before, but... it went together perfectly and looks gorgeous with my black granite sink top. I would highly recommend this faucet.